I've worked on a translation of a few paragraphs (see below) from the introduction (with thanks to Clara, Patricia and Olivia) and i would dearly love to have access to a full english translation so i could make wider use of this in my work in Canada and with the Catalyst Centre. 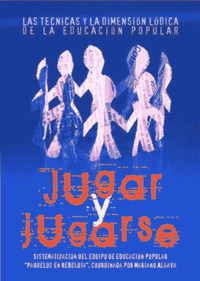 Algava is also part of a popular education collective called Pañuelos en Rebeldía (Scarves in Rebellion or Rebellious Scarves). There is some remarkable stuff here as well and i'm working on some translations. Feel free to work on some yourself (i'm starting with the page on Sistematizacion). A word about the title (thanks to reflections from Patricia and Clara): Jugar y Jugarse can be translated as "Play and Playfulness" but "jugarse" (likely an argentinian idiom based on jugársela) has a different sense than mere playfulness in that it includes a notion of risk taking which, though always a part of successful play, is not often thought of consciously. In english, my best guess for a more accurate translation would be "abandon" as in "to play with abandon" or "to abandon oneself to...". This has provoked for me many thoughts about the role of play in education and i will incorporate this into my ongoing project of articulating a trickster pedagogy. We would like to say something about this delayed re-release of "Play and playfulness." Delayed in the face of the four years of demand for this book during which we have been asked at marches, meetings and assemblies, “don’t you have a copy of ‘Play and playfulness’?” When we’ve discussed this in popular education groups, it gets out of hand quickly: word spreads widely from person to person and we end up exhausted with the "conference presentations" we’re asked to do. One tendency of paternalist politics regarding "popular education" has been the movement of a watered-down form into teacher training institutes, government programs, courses for volunteers, etc. However it is the “nice” version that moves this way – where popular education is seen as a “nice” way to intervene, a way to "look good" in group work, a “fun” alternative to transfer content, and, what is worse, includes the fatalism of naturalizing poverty and oppression. This is popular education acting within the framework of "the possible", where anything that dares dream beyond the horizon of "the possible" is repressed, jailed, frowned upon. The intent here is to drain Popular Education of its rebellious nature, of its origins in pedagogy of the oppressed, in order to integrate a dumbed-down form that can safely supplement the paternalism of "risk control." Given this, we affirm once again from our practice, that popular education is not a set of techniques and workshops for use by marginalized groups as remedial education for those who “dropped out”. Popular Education does not replace the "organization" needed to transform reality, nor is it a place for militancy without class consciousness. Popular Education aims to support diverse forms of resistance to capitalism, patriarchy, colonialism, racism, imperialism; and for socialism and challenging the commodification of all aspects of life. The construction of popular power (for the individual and the social) subverts and problematizes; this action is joyful, embodied and intellectual at the same time, creating new ways and new forms, is playful. It is the power of dreams and utopias and a radically liberating Popular Education that cannot be arrested. It is flowing water giving verdant life to the driest of deserts, nurturing seeds of rebellion, making it flower. Play and playfulness is the water that flows through local, popular and activist experience. fyi, the group Pañuelos en Rebeldía was originally associated with the University of Las Madres de Plaza de Mayo. The madres always wore headscarves when marching around the plaza, and that's become their logo.